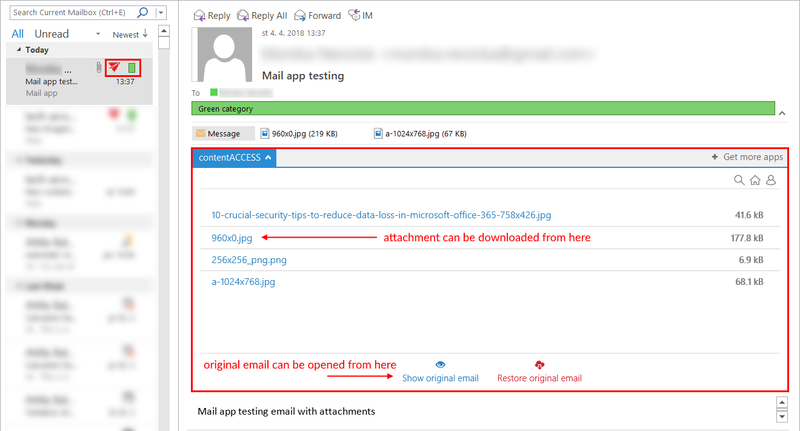 Mail app is a simple end-user friendly contentACCESS feature, which was designed to manually archive/restore from/to mailboxes directly in MS Outlook desktop version or OWA 2013 (or higher), without any need to use an email archive job. Native Outlook app on mobiles doesn’t support Mail app. MS Outlook 2013 or later desktop version or OWA. Proxy installed over HTTPS connection. 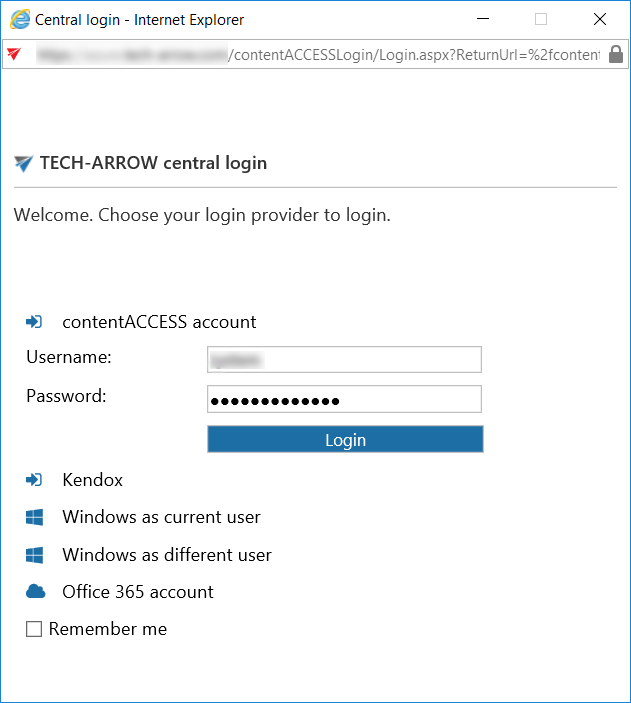 Default shortcut and a default retention must be set in contentACCESS Central Administration. On the System page (System tab => Services group => System button => External accessibility settings) a HTTPS alias must be configured. Role “Org Custom Apps” must be assigned for the EWS user on the Email archive System settings page in section EWS settings. This role enables an administrator to install and manage custom apps for the organization (read more about the role here). Activate Mail app for the desired mailboxes (section Activate mail app for). 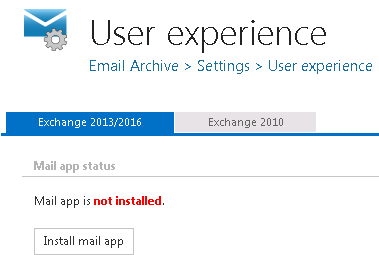 In section Mail app status you may install or remove mail app on the Exchange. 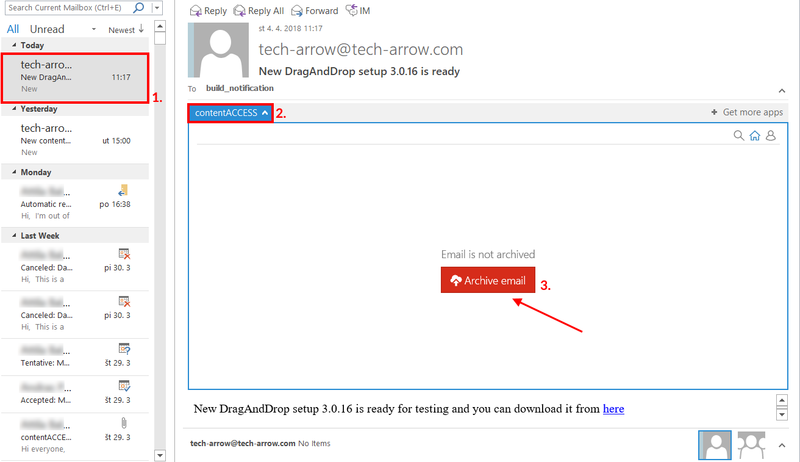 To install it, click Install mail app button and wait until the installation process is finished (Screenshot A). By clicking on option Remove mail app, you can uninstall this application from the Exchange; by clicking on Disable mail app, the application can be globally disabled (turned off) for all Exchange groups/mailboxes (Screenshot B). Screenshot A: Installing Mail app. Screenshot B: Uninstalling/disabling Mail app. The application is available for the user (in his mailbox) only in case that it’s activated for him. Once Mail app is installed, you can activate it for the mailboxes that will use this application. If Mail app is disabled, the activation settings are unavailable. Scroll down to section “Activate mail app for”. Use option “Activate for everyone” if the application should be activated for every user. To activate it only for a given Exchange group/Exchange mailbox, click “activate for mailbox” and select the desired mailbox(es)/group(s) from the list of the Mailbox selection dialog. In this use case (refer to the pictures below), we have activated it for one user only. 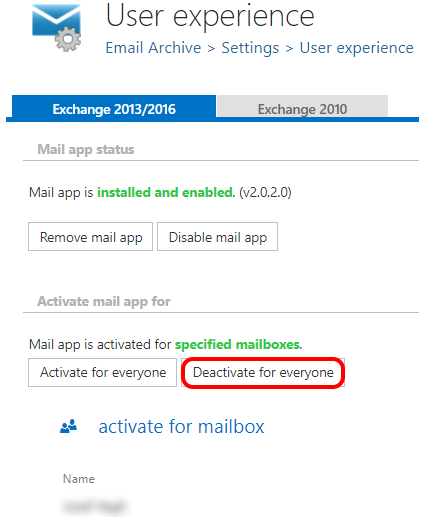 It is also possible to deactivate the application for all configured Exchange groups/mailboxes (option “Deactivate for everyone”). After you have installed Mail app, it is recommended to restart your Outlook. Open your Outlook desktop. If you checked the option to enable link security in System, section External accessibility settings, you will first need to authenticate yourself. 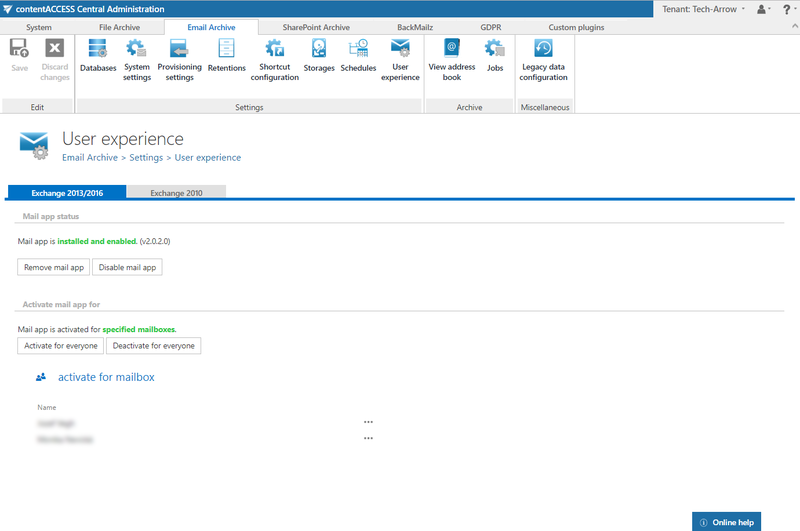 When clicking on the Login button, a pop-up with the configured Login providers opens. After successfully logging in, select a message (including an attachment) that you would like to archive manually (1). In the reading pane, click on contentACCESS Mail app (2)… Archive email (3) buttons. Note: If the email was already archived, you will get two options: Show original email or Restore original email. It cannot be archived again. The manual archiving job will use the default shortcut and retention. If we set an HTML shortcut, where green category has been set as default, our archived email will be archived with this shortcut and will be signed with green category. In the reading pane, click on contentACCESS Mail app again. To view the original email, click on Show original email option. To download the archived attachment, click on it in the message and it will be downloaded automatically. Important!!! 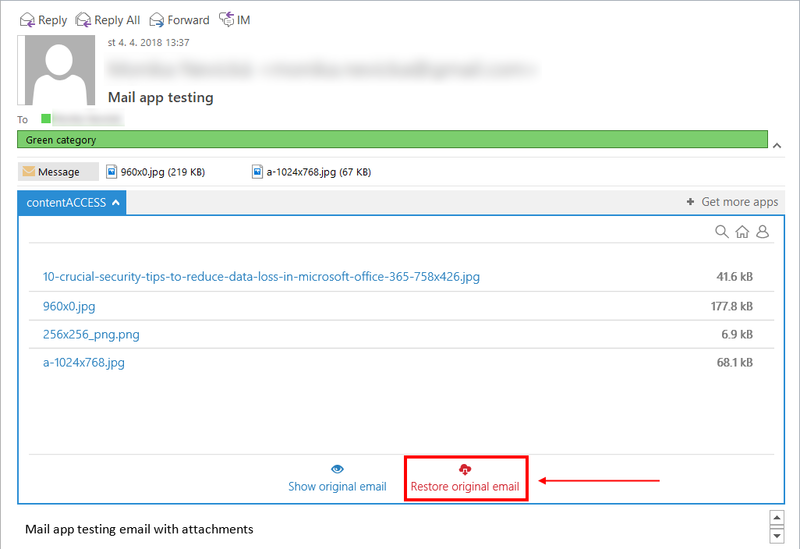 Turning on the Change message class option in the HTML shortcut configuration is a must if the user would like to manually restore from shortcuts, otherwise this app will not be visible in MS Outlook when trying to restore the original email. Note: In Mail app the “split attachments” function is active by default. That means that the body of the email and the attachment are stored separately. It is good to know: if the email message containing an attachments has been previously archived by a job, where attachments were not split, then the mail app in MS Outlook will show 0 attachments. To search in the available mailboxes, click on the search icon and enter the term you are looking for. It is also possible to sort search results by subject or date. The home button will return you to the home screen, from where it is possible to archive, restore, download attachments or view the original email. In the menu it is possible to view the current logged in user and to sign him out. After clicking on settings, you will be redirected to a section, where it is possible to view the server name, change the application language, view last logs (e.g. in case an error occurred) and also view/sign out the user. On the bottom are two buttons – Save (to save the changes) and Cancel (if you don’t want to save the changes).